February 10, 2009 June 15, 2010 / Leena S.
Bolay Ali, “Husain ho ab bhi hawaas mein! 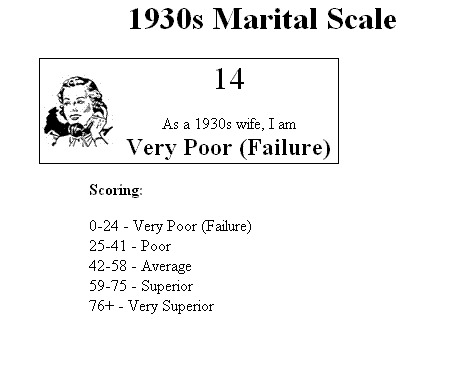 -18As a 1930s wife, I amVery Poor (Failure)Take the test! Best of luck with your break. Have fun! yea, awesome song. i still like it. Better wife? I scored -18. I’m 32 points behind you aunty! Leena, kahan jaa rahi ho? Aur kioon jaa rahi ho? Aur kioon aisey khuda-hafizzy khatt likh rahi ho? You’re not going anywhere!!!! Blog about something, anything, but blog yaar. Kuch hi toh log hain jin ko parh ke acha lagta hai! 93. As a 1930s husband, I am Very Superior! SAWJ, 1930s men were idiots. They were extremely chauvinistic and totally needlessly macho. I am NOT impressed. Are you marrying a feminine-type guy? wait.. wait… I just read the last part again. You’re not going to blog anymore?!! No! I can understand taking a break… but comeon KW, don’t disappear entirely on us. Especially those of us who aren’t in the Country and can’t call you up to chat. lol. First, a nostalgic song Bolo Bolo. Loved it! But if you listen to its re-make in Sajjad Ali’s new album, he actually ruined the song himself. But it was covered well by EP in their live version. Coming to the topic, we all should have known the islamic heroes, from Hazrat Ali (RA) to Hazrat Umer Farooq (RA). A column by Javed Choudhry would be a great help in this regard as he has compared Hazrat Umer (RA) and Alexandar the Great through statistics. Let me see if I could post it around. Btw, I’m also looking forward to get Satanic Verses. thanks for coming back after such a long time! where have u been? dude, welcome to the blog!! great to see u here and wen are u starting to blog urself? And do post the article u are talking about. @Jibran! Dude, Simply Adore the EP cover! they took a pathetic song and turned it into something else entirely! But I think this is nt the same song. Cuz I have nt heard it! I think I have never been exposed to pop culture! Khair! Im up with my blog myballyhoo.blogspot.com with its advertising magic =) do visit it.. Yes, but heres a confusion. I am enchanted by your (no way) ramblings that i want to admit it today. This post: That is so endearing, motivating, captivating and beautiful. SO are those confusions, so motivating, perplexing, wanting the future to be more better than the past. Sajjad Ali is a shia, why would he sing bolo omar omar?